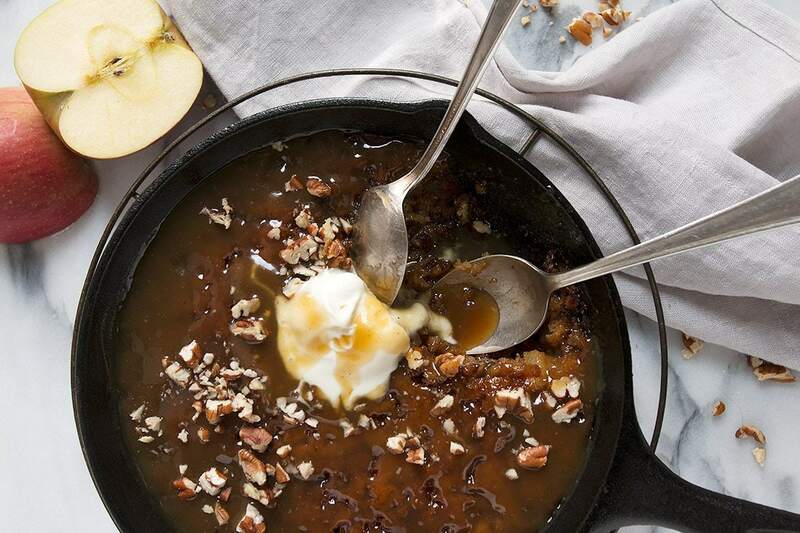 A twist on the classic, this Sticky Toffee Apple Pudding is made with no dates. Instead his one uses apples and apple cider for a lovely Fall and Winter dessert! Sticky Toffee Pudding has always been one of my favourite desserts and especially once the weather gets cooler. For the uninitiated, it’s not a pudding in the “put it in a bowl and eat it with a spoon” way. 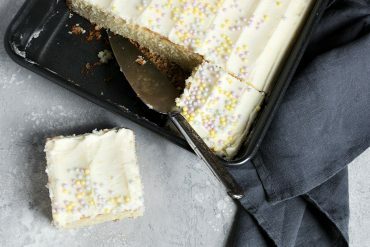 It’s a pudding in the British style – a cake. Classic Sticky Toffee Pudding uses dates and while I’m a fan of the date version, I don’t always have dates on hand. And besides, it’s Fall and apples are a great way to bring a twist to this classic. 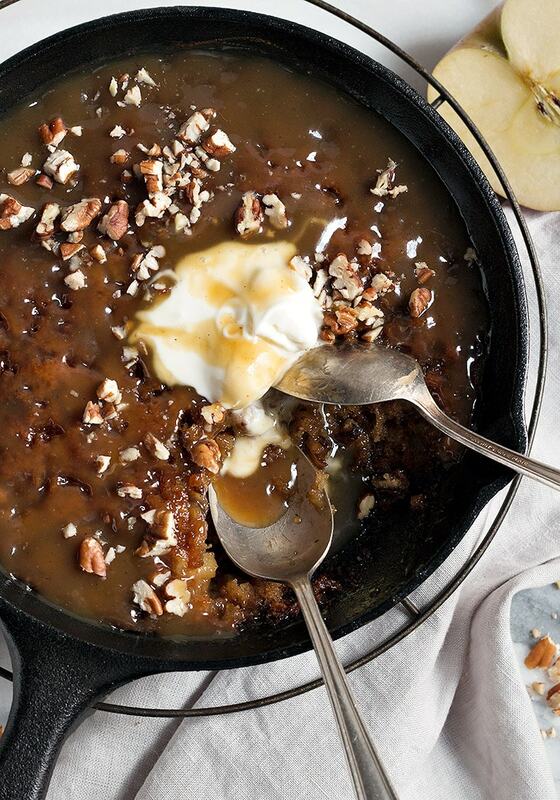 This sticky toffee pudding is a spin on the classic pudding, using apples instead of dates. It also features some chopped pecans for flavour and a bit of light crunch. 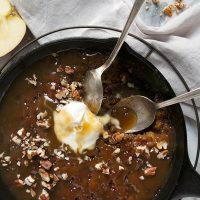 The result is every bit as comforting as the original with a nice change in flavours and of course, made easily anytime with just a few apples..
Of course, one of the best parts of Sticky Toffee Pudding is the toffee sauce, so there’s plenty of it with this apple version as well. If you don’t have apple cider on hand, you can substitute apple juice, though unsweetened would be best. Unsweetened applesauce would work as well. I would maybe thin it slightly with a splash of hot water, then let stand until cooled before using. If using sweetened apple juice or applesauce, you may wish to reduce the sugar in the cake slightly. In a pinch, I think you could even just steep some cut up apples in a cup of boiling water, then remove apples and use that liquid. You can also make these in individual ramekins, for single servings. The size of ramekin doesn’t really matter, just bear in mind not to fill any more than 2/3 full (as they rise! ), bake on a baking sheet (in case they spill over a bit) and test often as they bake, as baking time will be less. 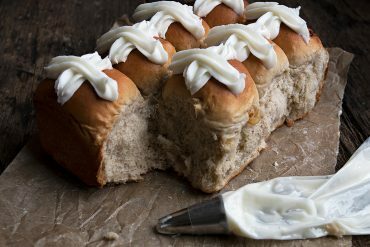 A scoop of vanilla ice cream or lightly sweetened whipped cream is nice on top to serve. Make it “for two” sized! 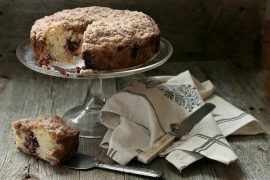 For a nice dessert for 2 (or 3), simply halve the recipe and bake it up in a 6-inch skillet or similar sized baking dish. (Shown here is mine, baked in a 6.5-inch lodge cast iron skillet). Want to add a 6.5-inch cast iron skillet to your kitchen? This one would fit the bill perfectly, at a great price! 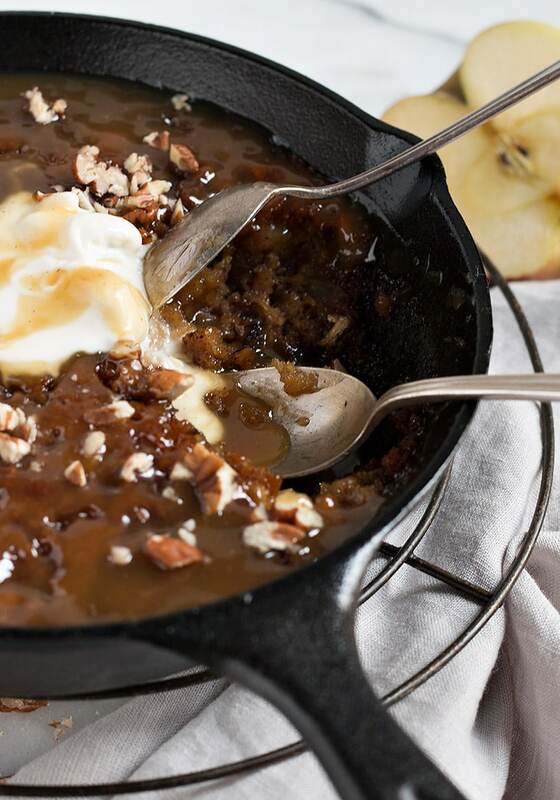 A variation on the classic sticky toffee pudding but with apples instead of dates. Of course it has that fabulous toffee sauce, though. In a medium-sized saucepan, heat the apple cider over medium-high heat until boiling. Remove from heat and carefully stir in the baking soda. *Mixture will bubble up considerably so don't skimp on the saucepan size. Allow to cool while you prepare the rest of the batter. *You can also do in the microwave in a large bowl. Preheat oven to 350°F. Butter or spray with cooking spray a 9x9 baking dish or a 10-inch top diameter cast iron skillet. 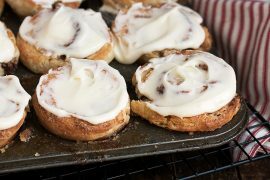 In a large bowl or bowl of a stand mixer, beat the butter and white sugar until light and fluffy. Add in the eggs, one at a time, beating well after each addition. In a small bowl, combine the flour and spices. Add half the flour mixture to the butter/sugar mixture. Mix to combine. Add half the cider and stir in. Add the rest of the flour and the rest of the cider, stirring after each addition. Add the diced apples and chopped pecans and stir to combine. Pour into prepared pan and place in preheated oven. Bake for 30-35 minutes or until it tests doneness with a toothpick in the center. It should come out clean and the top should be browned. Using a skewer, poke some holes all over the cake, then pour 1/2 of the toffee sauce over cake. Allow to stand a few minutes (to allow it to soak in), then pour the remaining toffee sauce over-top. You can substitute unsweetened apple juice for the apple cider. Or mix 1/2 cup unsweetened applesauce with 1/2 cup hot water, then let cool before using. For a dessert for two (or 3), halve the recipe and bake up in a 6-inch skillet or smaller dish. 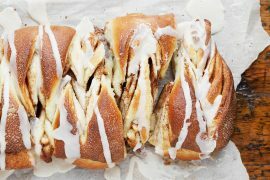 I love this apple inspired gorgeous gooey dessert! I would probably sit there until the skillet was licked clean :) Ice cream is a must for me. Pinning Jennifer! This pudding looks absolutely sensational, Jennifer!!! I’m loving the apple and toffee combo – so good! I was going to say I’m thankful you excluded dates since my husband hates them, but I just realized that means I’m going to have to share this dessert with him! Womp womp. ;) Guess I better make two, huh? Cheers! Lol! He’ll love this one :) Thanks Cheyanne. If Sticky Toffee Pudding is on a restaurant menu, it will ALWAYS be my first choice. I love the idea of apples instead of dates! I really like your idea of steeping apples slices. My grandma used to do it with quince slices as we had a generously producing quince tree and I’d love to try it with apples. 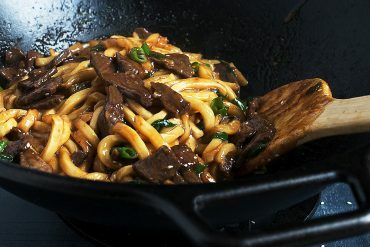 Besides that – I’m loving this skillet creation! 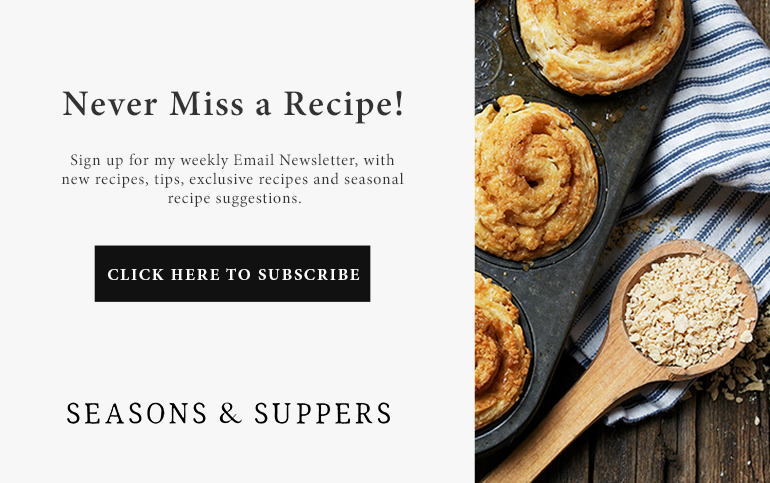 On my list of recipes to try! 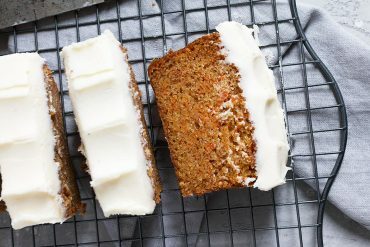 All the cozy and comfort in one delicious dessert!! My eyes are happy! And my tastebuds are soon to be! Pinned! I’m loving this twist on the classic Jennifer. I don;t always have dates either, so I’m loving the use of the apple cider, which I always have during the fall and winter months. Can’t wait to give this a try. It’s such a cozy dessert! 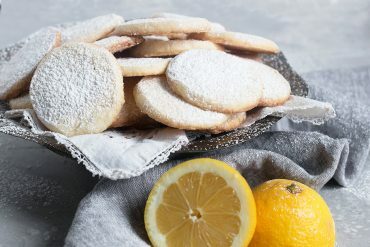 Sounds delicious- I would like to make this recipe for a party, but was just wondering about proportions for doubling or tripling the recipe? This looks amazing! So simple but strong flavour!! My family will be very impressed. Hi Harris. It really doesn’t matter the exact size of your ramekins. Simply fill 3/4 full until you’ve used all your batter. Only the yield will change based on ramekin size. I just checked mine. I used 4 ramekins that hold just under 1 cup of water (to the top) and 2 ramekins that hold about 3/4 cup of water. So my yield was 6. If I’d used all of the smaller size, I would have easily made 8. Can I get a more precise idea of what a “ramekin” size might be? thanks. The toffee sauce is really good, Anna. In fact I increased it from the original recipe because I needed more of it. I am excited about the toffee sauce. I can make a little more than what is in your recipe because I just love to have extra sauces for quick party preparations. I can buy baked treats and then pour over my special sauce and I already have an instant dessert. Hmmm…I am thinking of pouring this over fresh fruits too. Thanks for sharing!